I’m reminded of that when I remember the first day I held my kids and when I watch them navigate their way through growing up. I’m reminded of it whenever I experience the loss of a loved one, either gone too soon, or after a life well lived. Too precious to waste in trivial, meaningless jobs. Too precious to squander with people who do not appreciate the opportunity that they’ve been given. Too precious to just spend your days in a hamster wheel, with a blur of activity and nothing to show for it. 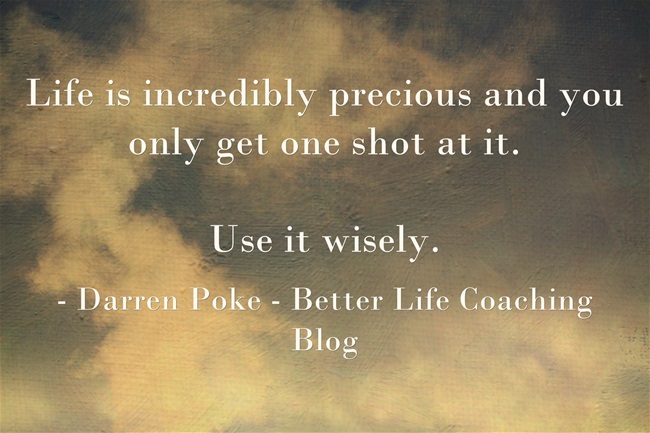 Life is incredibly precious and you only get one shot at it. Live with joy and enthusiasm. Find out why God placed you here. Help others to fulfill theirs. Your life is incredibly precious. Will you live it in all its fullness? Or will you fritter it away?